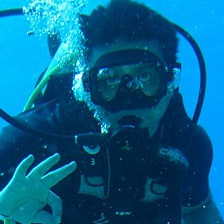 I am a PADI Master Instructor as well as a SSI Dive Control Specialist Instructor and have been teaching since 1993. I do the majority of my teaching at Splash Aquatics in Santa Clara, CA. However if you have a pool and want private classes I am willing to travel throughout the bay area. Prices for classes do not include equipment. For Open Water Classes, you must provide you own mask, fins, boots, gloves and snorkel.